GBP/USD falls after talks between the government and the opposition stalled. The move comes despite upbeat data and a positive market mood. Downtrend resistance proved its strength. GBP/USD is down to around 1.3050, hitting the lowest levels in a week. Labour leader Jeremy Corbyn said that there is no agreement on a customs union between the government and the opposition. He said that the government is not shifting on its red lines and blames hardliners in the Conservative Party for wanting a deregulated low-tax society that will deal with Trump. The news sent the pound down despite upbeat data. UK unemployment remains at a record low of 3.9%, and wage growth holds its ground at 3.5% YoY. In addition, stock markets are positive, and the risk-on mood should have helped Sterling surpass the US Dollar. Nevertheless, Brexit dominates, even after the long delay. Further responses to the stalled talks will likely dominate the next moves. Downtrend resistance works. Once again, GBP/USD could not break higher. The failure opens the door to lower ground. The Relative Strength Index on the four-hour chart also turned lower and the pair lost the 50 Simple Moving Average. 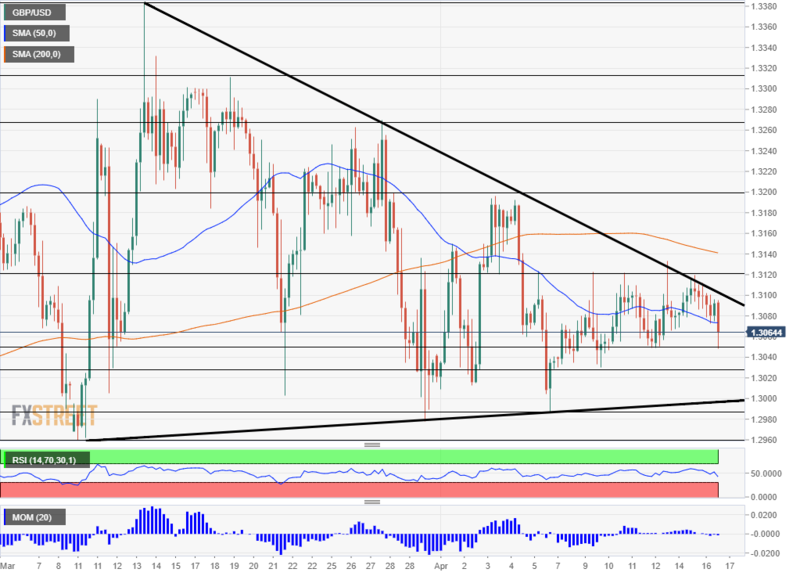 Below 1.3050, cable has support at 1.3030 which was a low point last week. 1.2985 was the trough in April and 1.2960 was the low point in March. Resistance awaits at this week's highs at 1.3120, followed by the April high of 1.3200. 1.3270 and 1.3315 are next. Another top-tier economic indicator awaits the pound on Wednesday. See UK inflation preview: Can a second positive piece of data lift GBP/USD?